Sophie Anderson, adventurer and expert designer, presented her most recent designs during Paris Moda 2011 “Inspired” on the work of an indigenous community from La Guajira, Colombia: The WayuuFor the ones of us that know their work, there is absolutely no difference with the originals since this are the exact same mochilas Wayuu. 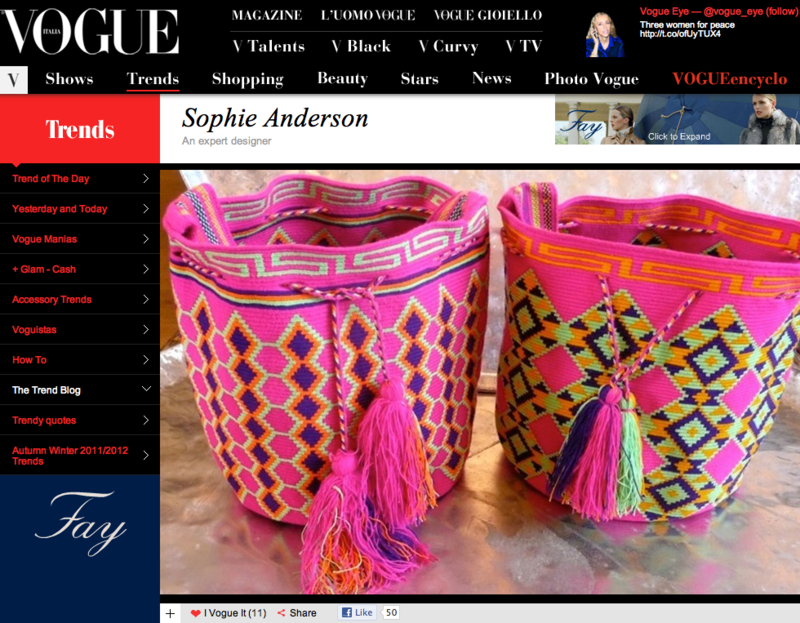 Several persons protested the Vogue magazine which published in their cover page a picture of this Wayuu bags as Anderson’s own. Vogue magazine and Anderson explained a “confusion” and apologized after many protesters claimed for a retraction and respect for the Wayuu rights to their legendary work. This kind of “plagio” keeps happening over and over and some designers expropriate traditional works without rights to them. We may see it on cultural fashion as well as in accessories. Exposure of real indigene’s work in a global context is benefiting more this designer/merchants than the indigenes the tribes who are paid pennies under the promises of a long term commerce deal they never get. During my last trip to Colombia, another of our millenaries cultural traditions “El Carriel Paisa” is displayed with “Hernan’s Sajar” mark and no proprietary allusion to the cultural tradition or the Town that have make them since the beginnings. May be Is it time to establish an international organism to defend cultural traditions, rights of ownership and have tribal artists profit from the right to their work as musicians or designers do and defend. Mother’s day next Sunday is a good opportunity to appreciate and talk about this beautiful, very popular art from the Kuna tribe that inhabits the San Blas Islands in Panama and Colombia. Against popular believe the Mola is not a very old Art. It is believed to have born after the European colonization and may make one of the first traces of a-culturing made around the tribe influenced by religious groups. The most interest fact of all and what motivates our timely reference is that the Kuna was a Matriarchal society. The woman was the center of their social circles and considered of superior judgment making dominant part of the society decisions and between others, respected for her procreating powers. The heirs were passed always through a woman and even when single were considered important because of their capacity to bring man power to the group either from marriage or throughout procreation. The Mola is worn then by the Kuna women in a perfect pair in the front and back of their blouse replacing the tattoos that were covering their bodies before the colonial time mentioned. They are used today as décor in several forms and they are in most cases a reminder of a feminine power and value that has being present through time regardless of popular believes.